All OmniTrust™ Vinyl Gloves are DOP/DEHP Free! Vinyl gloves are a great choice for individuals seeking an alternative to latex. Because of latex allergy issues, OSHA has recommended that workers use latex gloves only in situations that require protection from bloodborne pathogens and other infectious agents. 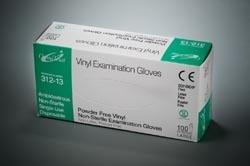 Vinyl gloves have experienced strong growth from those concerned about worker safety and the liability issues currently surrounding latex allergies. Available in sizes Small through Extra Large.